(Bloomberg) -- A former premier and vocal proponent of independence for Taiwan will challenge his former boss, President Tsai Ing-wen, for the ruling party’s nomination, ensuring the island’s tense relationship with China will be a central focus of the presidential campaign. Former Premier Lai Ching-te said in a text message on Monday that he would vie for the Democratic Progressive Party’s backing in the election slated for next year. Lai -- a former mayor of the southern Taiwanese city of Tainan who once described himself as an “independence worker” -- resigned in January, weeks after the party suffered a resounding loss in local elections. Tsai, who is almost three years into her first term, has said she plans to seek re-election despite receiving support of less than 30 percent in most recent polls. Although Tsai stepped down as the DPP leader after losing several counties and cities to the more China-friendly Kuomintang opposition in November, she had so far faced no obvious challengers from within the party. Tsai spokesman Xavier Chang said via text message that Lai’s candidacy doesn’t change the president’s plans to run. Tsai said in a Facebook post Monday that she planned to submit her formal application to run before the end of the week. The DPP is scheduled to announce its candidate April 17. Beijing has said any moves by Taiwan to formalize its status as a sovereign state separate from mainland China would be grounds for invasion. The two split during the Chinese civil war in 1949. Lai has pointed to the risk of the DPP losing not just the presidency but also its hard-won majority in the Legislature as a motivating factor behind his decision to run. Taiwan is expected to hold legislative elections on the same day as the presidential vote. “We need to impress voters so that the DPP can win both the presidential and legislative elections in 2020,” he told supporters at a temple in Tainan on Tuesday. Lai is likely to see strong support in southern Taiwan, a traditional DPP stronghold. 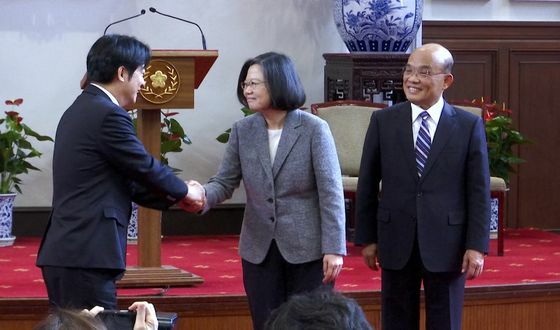 After Tsai appointed Lai premier in August 2017, he described himself as a “Taiwan independence worker” and said the island was already a sovereign independent country, according to Taiwan’s Central News Agency. The opposition KMT, which has run Taiwan’s government for all but 11 years since 1949 including decades under martial law, may have a crowded nomination contest. Former New Taipei Mayor Eric Chu and ex-parliamentary speaker Wang Jin-pyng, who both support closer China ties, have already announced their candidacy and KMT Chairman Wu Den-yih may also run. An October poll by Taiwan’s Mainland Affairs Council found that some 23 percent of Taiwanese people support formal independence either immediately or at some later date, while 19 percent support unification. Most of the rest are in favor of maintaining the status quo.